We asked this question a great deal when putting together this issue. Almost universally, the answer seems to lies in a sense of community; the idea that we are all stronger when we work together or through the bonds of friendship or family. 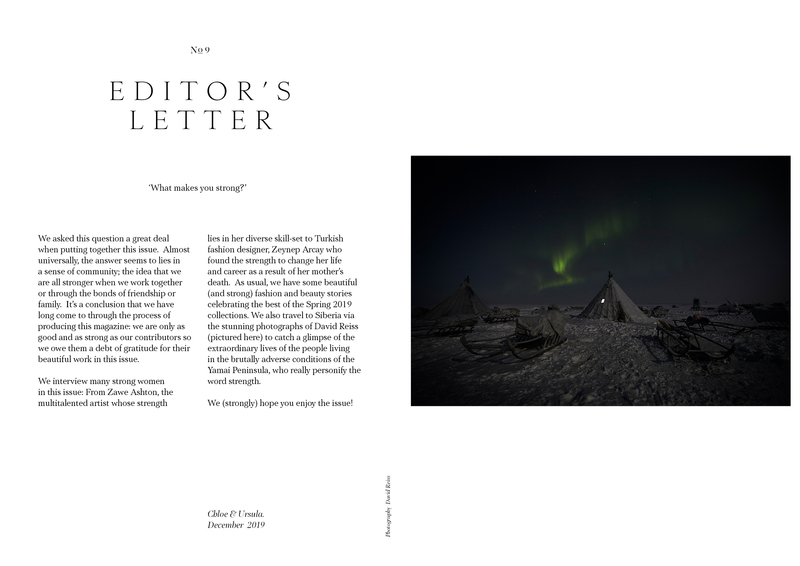 It’s a conclusion that we have long come to through the process of producing this magazine: we are only as good and as strong as our contributors so we owe them a debt of gratitude for their beautiful work in this issue. We interview many strong women in this issue: From Zawe Ashton, the multitalented artist whose strength lies in her diverse skill-set to Turkish fashion designer, Zeynep Arcay who found the strength to change her life and career as a result of her mother’s death. As usual, we have some beautiful (and strong) fashion and beauty stories celebrating the best of the Spring 2019 collections. We also travel to Siberia via the stunning photographs of David Reiss to catch a glimpse of the extraordinary lives of the people living in the brutally adverse conditions of the Yamai Peninsula, who really personify the word strength. We (strongly) hope you enjoy the issue! Cover image of Zawe Ashton by Pelle Crepin with Fashion Editor, Steph Wilson. White crop top by 3.1 Phillip Lim.